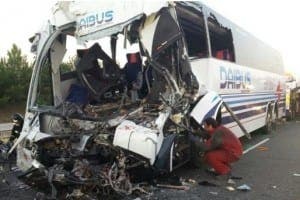 TWO people have been killed and 46 injured after a tragic bus crash in the early morning of June 5. The bus, travelling from Algeciras to Madrid, crashed into a broken down lorry at 3am on the A-4 road near Montoro in Cordoba. 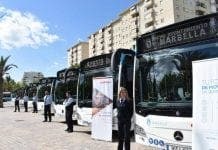 A total of 55 people were on the bus with many foreigners including 31 Moroccans, two Singaporeans, an American, a Colombian, an Ecuadorian, a Romanian, a Mauritian, and a person from the Ivory Coast. The bus driver and another Spaniard were killed while four people sustained severe injuries. The broken-down lorry drivers were standing on the side of the road and witnessed the accident but were unharmed. A high court judge investigating has declared ‘with the information from the Guardia Civil so far, neither of the drivers are guilty of negligence in this catastrophe’. The driver of the doomed bus tested negative for alcohol in his blood while the other drivers had signalled their breakdown. Earlier this year, 13 students were killed in a Catalunya coach crash after the driver lost control.